BEIJING - The central bank is planning new investment funds to diversify holdings in the nation's $3 trillion foreign exchange reserves, to hedge against depreciation and inflation risks, according to a news report. The proposed funds will invest some of the foreign reserves in energy and precious metal markets, the New Century Weekly said on Monday, citing unnamed sources close to the People's Bank of China. However, the report did not disclose the size of the proposed funds, their operation methods or the timing of their possible launch. The central bank was not available for comment. Foreign exchange reserves jumped by $197 billion to $3.04 trillion in the first quarter, marking the second-biggest increase on record, central bank statistics show. That fueled concern over devaluation risks and over-exposure to US debt. 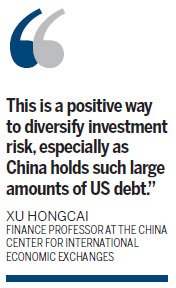 "This is a positive way to diversify investment risk, especially as China holds such large amounts of US debt," Xu Hongcai, a finance professor at the China Center for International Economic Exchanges, told China Daily. While China has been slashing its US debt holdings since October, it still remains the largest creditor. At the end of February, China held $1.15 trillion of US debt, down $600 million from the previous month. US debt, once considered gilt-edged, is becoming increasingly risky. Credit agency Standard and Poor's downgraded America's credit outlook in April from stable to negative for the first time in history, implying that the US has been put on notice that it faces losing its AAA credit rating unless it gets on top of its yawning debt and deficit. Earlier this month, Zhou Xiaochuan, the central bank governor, said China's foreign exchange reserves had exceeded a "reasonable" level and the management and diversification of the holdings should be improved. The central bank's plan to set up new funds will diversify risk by creating new investment bodies, said Xu. Currently, China Investment Corp (CIC), the country's sovereign wealth fund, is mainly responsible for the overseas investment of China's swelling foreign reserves. Established in 2007, CIC is now waiting for a capital boost plan from the State Council. Diversifying reserves through investment agencies, such as CIC, is a possibility, Zhou said on April 18, after a speech at Tsinghua University, and also highlighted a possible option. "One option is to consider some new types of investment agencies which focus on new investment areas." Xu said he believes another way to reduce risk to the foreign exchange reserves is to transfer some funds to commercial banks as long- and medium-term time deposits, so private enterprises can get them when exploring overseas markets. "That should be a win-win deal, as the central bank can also secure a yield higher than US debt," said Xu. According to the New Century Weekly, the central bank is also considering a fund that could intervene in the foreign exchange market to stabilize exchange rates on behalf of the central bank. The growth in foreign exchange reserves may affect efforts to curb inflation. Yi Gang, deputy governor of the central bank and head of the State Administration of Foreign Exchange, said earlier that to keep the exchange rate stable the central bank had to roll out nearly 20 trillion yuan ($3.04 trillion) last year, thereby fueling inflation.